The KönigsSalz SALARIUM® represents quality on the highest level. The construction, building materials and technical equipment are designed to accommodate all requirements. Due to its patented rail system even a salt ceiling construction is possible. Moreover no adhesives, PU foam, silicone and other materials, which are not beneficial for the health need be used for building. The air quality and the salt level are one of the key elements. In the KönigsSalz SALARIUM® the air quality is documented and recorded. A controlled ventilation system provides optimal air quality. The salt and oxygen levels will be measured by means of sensors and automatically maintained at a constant level during the sessions. The KönigsSalz control continuously measures temperature, humidity, CO² and the salt level. Due to the measured values, the various devices are controlled as required. 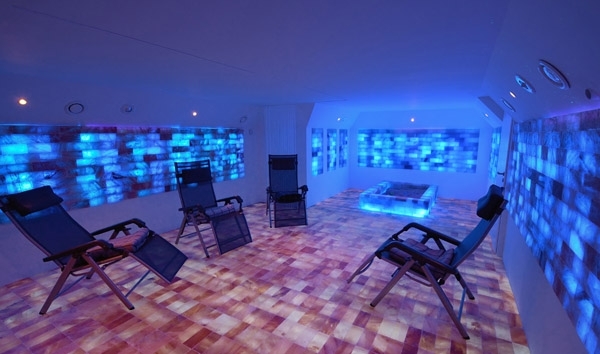 In order to achieve deep relaxation, the KönigsSalz SALARIUM® is equipped with natural sound emitter and starry sky. Even at low volume natural sound emitters have an extremely fine, precise and gentle sound reproduction. The sound flows through the entire body and enhances its wellbeing. A glance at the starry sky without any electrical light points induces calming effects on the entire organism and influences the thoughts resp. mind positive. Forget everything you know about salt caves. A KönigsSalz SALARIUM® is not a cave, but a harmonious oasis of salt equipped with branded technology from one provider, innovative technology and equipment on the highed level.